While Memorial Day marks the kick-off to summer, I know that many of us won’t step foot in a pool with this crazy weather. Since you can cannonball into a pool, take a dive into one of these dip recipes! Mix ingredients until well blended; cover. Refrigerate until ready to serve. 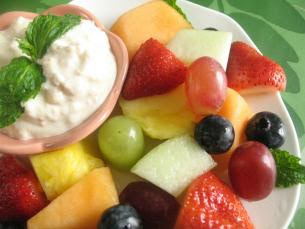 Serve with assorted cookies or cut-up fresh fruit. In a microwave safe bowl, heat cream cheese on high for 1 minute. Stir in sour cream, milk, mayonnaise and Worcestershire sauce. Add the kielbasa or sausage, 1/4 cup of the onions and the Parmesan cheese. Microwave on high for 3 to 4 minutes. Sprinkle with remaining onions. Serve with crackers, corn chips or vegetables.